Cowboy Song was recorded during The Real Thing sessions between November and January 1988/89. The track was first featured as a B-side on the 7 and 12 inch release of From Out Of Nowhere in 1989. It was later included as The Cowboy Song, an extra track on Live At Brixton Academy in 1991. 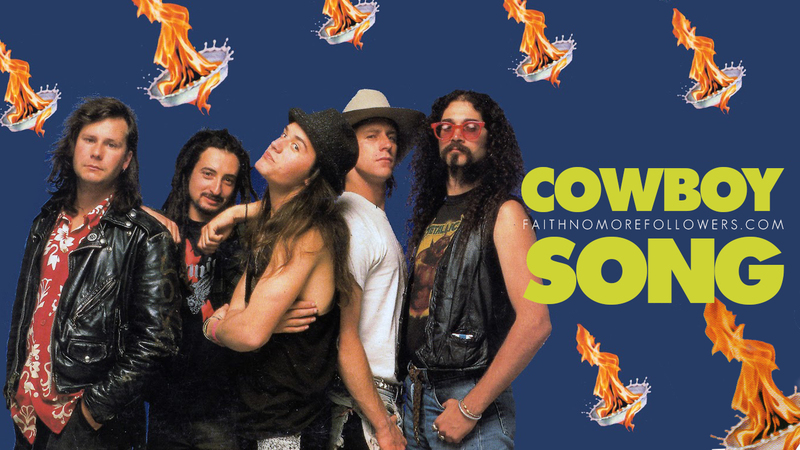 It appears as The Cowboy Song on 2003's This Is It (The Best Of Faith No More). It is included on CD2 of Rhino Records' duluxe version of The Real Thing, released in 2015. An early demo of the song exists, recorded with a select few songs from The Real Thing in October 1988 on a TASCAM Four Track demo recorded in Bill Gould's attic. This recording was to demonstrate Mike Patton's vocal abitlities to Slash Records. No evidence exists that the song has ever been played live except vague recollections by Bill that it may have been included in the set for Mike Patton's very first show in November 1988.